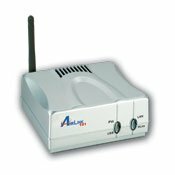 The APSUSB201W is a compact printer server that connects to your current Ethernet network. Through its USB port it allows users on your network to access and share a USB printer regardless where they reside on the network. With its compact size the APSUSB201W can be placed virtually anywhere. Featuring wireless networking, the APSUSB201W takes advantage of your exisitng wireless network to carry out its printer sharing capabilities. If you have any questions about this product by AirLink, contact us by completing and submitting the form below. If you are looking for a specif part number, please include it with your message.